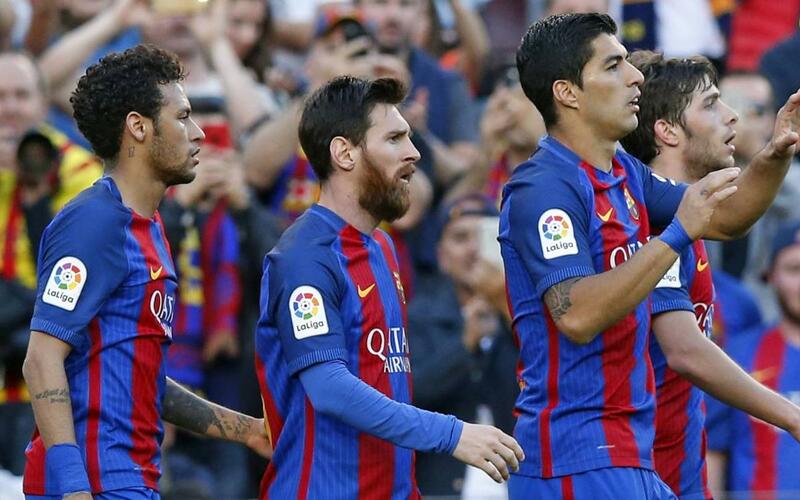 With one game left in the 2016/17 season, Barça finds itself on the outside, looking in. Over the last several weeks, the heavy, wooden door that represents the Catalans’ La Liga title hopes has been slowly creaking shut. The ample light that had once flooded through the doorway is mostly gone. Barça's face is pressed up against the doorjamb as it squints with one eye through an ultra-thin crack offering one final glimmer of hope. But a crack is all Barça needs. A victory over Eibar on Sunday, coupled with a Real Madrid loss at Málaga, won’t just keep the door from closing — it will blow the door wide open, and clean off its hinges. A Barça win over Eibar and a Real Madrid loss to Málaga will give Barça their third straight La Liga title and their 25th all-time...If Barça win La Liga Head coach Luis Enrique Martínez will become the third coach in Club history to achieve a three-peat after Pep Guardiola did it in the 2008/09, 2009/10, 2010,11 seasons and Johan Cruyff did it in the 1991/92, 1992/93, 1993/94 seasons...Barça have played Eibar five times before in La Liga (three away and two at Camp Nou), outscoring them 16–1...Barça are riding an 11-game home winning streak in league play, the team’s best such streak since they won 15 straight at Camp Nou in the 2012/13 season under Tito Vilanova...Barça have won six straight league games both home and away, the best active streak in La Liga...Barça have scored 112 goals in La Liga this season, three shy of the team-record 115 they scored in 2012/13 under Tito Vilanova...Lionel Messi is tied with Edinson Cavani for most goals (35) among Europe’s top 5 leagues...Messi leads the Golden Shoe race, however, since the French First Division is not weighted as much as La Liga...Messi is also the all-time league leader in goals scored against Eibar with six goals in four games...Luis Suárez has scored the first goal in a game nine times this season, most in La Liga...It’s Luis Enrique’s final La Liga game for Barça and final game at Camp Nou. His record over three seasons is 86 wins, 14 draws, 13 losses, a winning percentage of .761, the third highest in team history after Tito Vilanova (.890) and Pep Guardiola (.763). For this match, Luis Enrique will not be able to count on the injured Rafinha, Mascherano, Aleix Vidal and Mathieu. Moreover, Gerard Piqué continues to recover from his abdominal pains that have kept him out for ten days. He will not be included in the squad for the Eibar match. On the plus side, Sergi Roberto is available again having missed the Las Palmas match due to suspension. The centre backs from Barça B, Marlon Santos and Borja López complete the squad. Therefore, the final match day squad for the Eibar match is: Ter Stegen, Cillessen, Rakitic, Sergio, Denis, Arda, Iniesta, Suárez, Messi, Neymar Jr, Paco Alcácer, Jordi Alba, Digne, Sergi Roberto, André Gomes, Umtiti, Marlon (33) and Borja López (35). Eibar, which was founded in 1940, is in its third straight season in the Spanish First Division, having made it to the top flight for the first time in Club history for the 2014/15 season...Eibar has improved every season, debuting with 35 points (18th place), getting 43 last season (14th place), and they currently have 54 with one game left (8th place)...Eibar is currently in 8th place and is guaranteed to finish in the top half of the table. Alavés (which plays at Leganés), are even on points and in 9th place. Espanyol (which plays at Granada) is one point behind in 10th place...Eibar head coach José Luis Mendilibar (previous stints at Athletic Club, Valladolid, Osasuna, and Levante) has lost 12 of has 14 games coached against Barça with a win and a draw. He has never left Camp Nou with a point.